Interesting news last week that Paul McCartney’s very first solo work outside the Beatles is to get a decent CD release in July this year. This is the Australian pressing – which came out on Decca Records originally in 1967 (though my copy is a re-issue). In the UK the LP also came out on Decca, while in the US it was released on the London label. The LP has 13 tracks but interestingly (as you can see on the label image above) there are no titles for any of them. 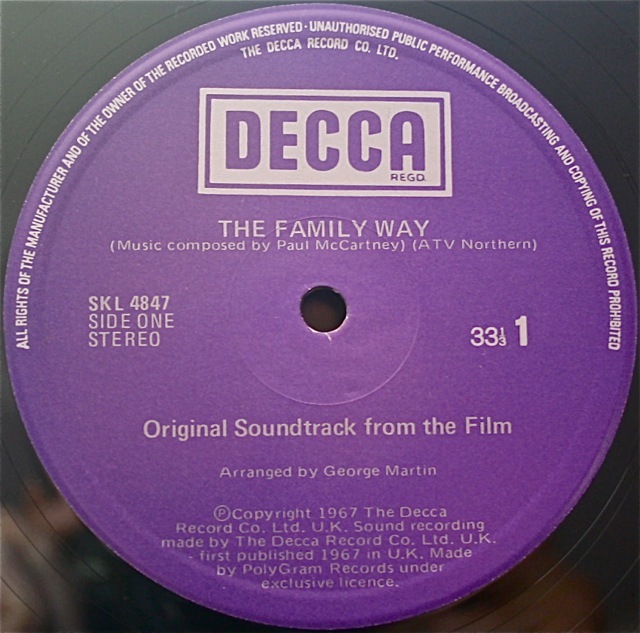 “The Family Way” will be released on CD on July 26 by specialist soundtrack label Varèse Sarabande, based in California. It takes a bit of a search to find any references to the forthcoming CD on their website. You have to go to the “Vintage News” section and there’s information contained there when you scroll a fair way down the page….. 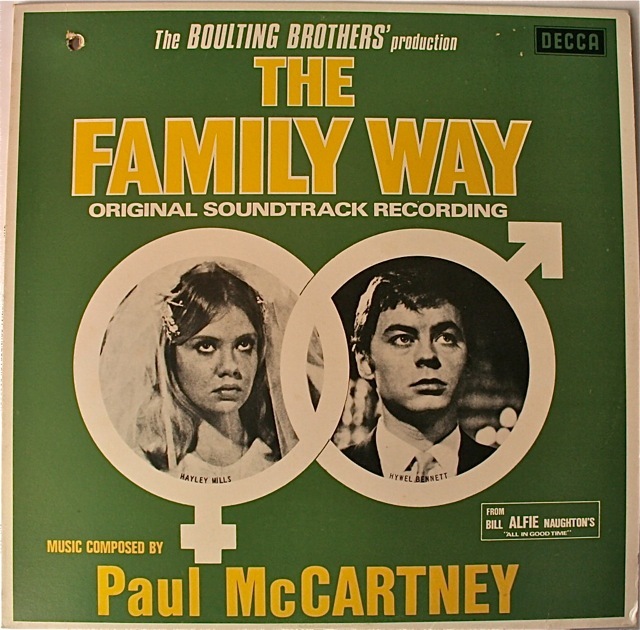 The original 1967 soundtrack recording of “The Family Way” contains both the above McCartney themes, the main theme and “Love in the Open Air” – plus eleven more score cues suited to the on-screen action. Varèse Sarabande says that for his composition McCartney was initially inspired by the sound of brass bands, familiar to his childhood in the North of England. Steve Marinucci in his Beatles Examiner column says the new single-disc release will be taken from the original mono master tapes and will feature sleeve notes by Chip Madinger, author of a new book on the Beatles solo work called “Eight Arms To Hold You“. 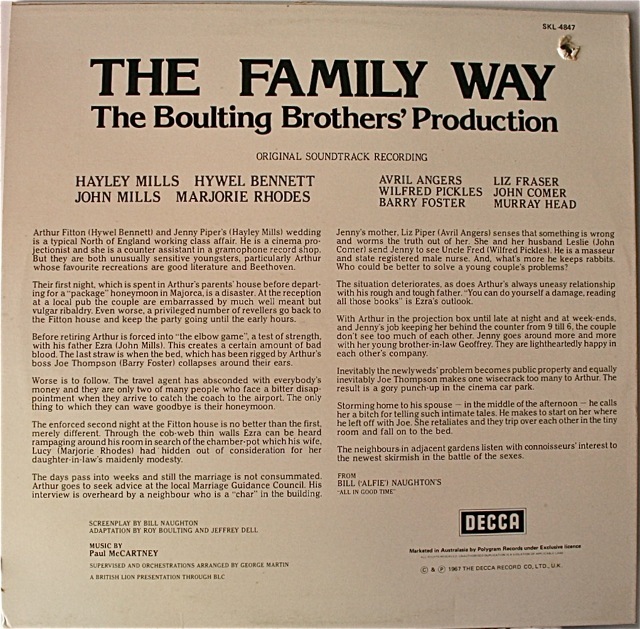 The CD will also include a previously unreleased stereo mix of “A Theme From ‘The Family Way'”, a rarity that in 1966 appeared as the b-side of a 1966 UK/US 7-inch single by a band called the Tudor Minstrels. This entry was posted in Beatles, Beatles Collecting, Beatles Music, Beatles Related, George Martin, Paul McCartney and tagged Beatles, Beatles Collecting, Beatles Related, George Martin, Paul McCartney, The Family Way by beatlesblogger. Bookmark the permalink.